A report on the AGM held at Yate Parish Hall on 21st March. 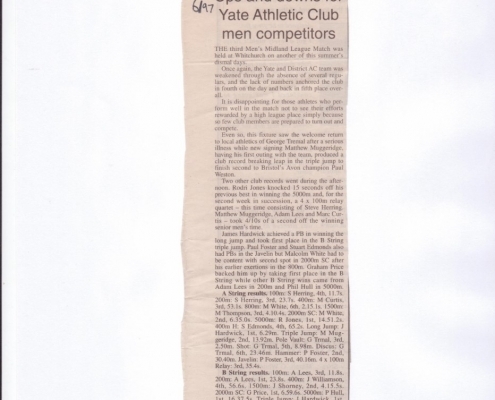 Yate AC and Westbury Harriers decide to form a partnership. 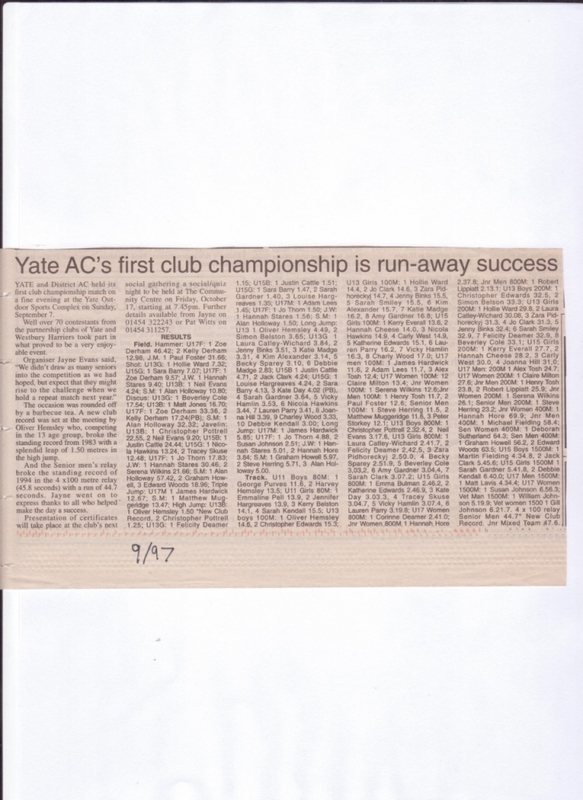 The Avon AA Track and Field Championship will be held at Yate track for U13 and U15’s. The U17’s, Juniors and Seniors will be held at Bath University and combined with Somerset. The partnership with Westbury Harriers has increased the number of athletes available for track and field teams but there are still some holes in the teams. There are rumblings of a Midland Counties Registration Scheme which could cost as much as £10 per athlete per year. Fears are of athletes leaving the sport. A Whitsun draw raised £216. A joint Westbury/Yate skittles evening at the Swan, Tytherington raised £80. Other social events planned are a disco, quiz evening, BBQ and Christmas meal. Pat Gallagher sets a new world vet over 50 800m record of 2.22. Zoe Derham wins Gold in the Hammer and Bronze in the Discus at the Midland Counties U20 Championship. 2 Silver and 2 Bronze medals also came from James Thie, Matt Thompson, Hannah Stares and Jo Thorn. 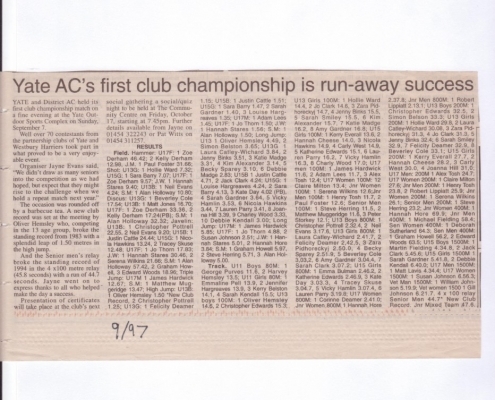 Resume of track and field season – Womens Midland League team finally make it into division 1. The Mens Midland League team just manage to stay in division 5. 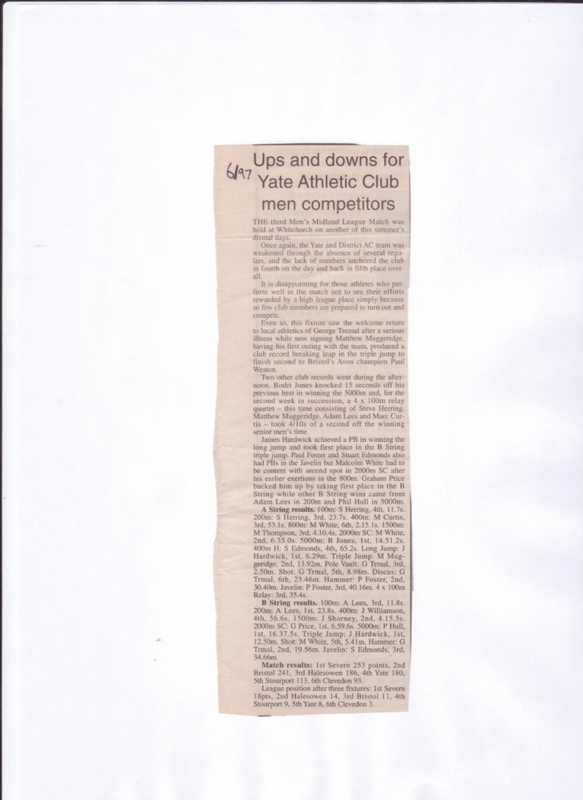 The Junior Mens and Womens teams did quite well and the National Young Athletes Girls team finished bottom of the premier division. In the Avon League the females won everything and the males nothing. South Gloucestershire Council has secured lottery funding for the new facilities and building should start on 6th October and last for 30 weeks. Zoe Derham wins Gold at the AAA’s Championship with a new U17 UK record Hammer throw of 48.66. Hannah Stares wins Gold at the Midland Counties Combined Events Championship and Sarah Barry wins Bronze in the U15 Girls Pentathlon. Jo Thorn represents the Avon Schools Heptathlon team at English Schools. 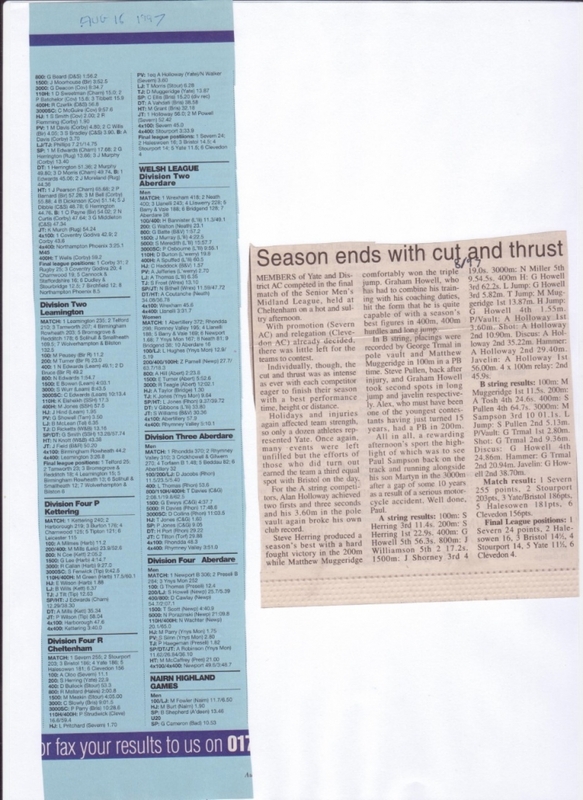 A fixture list for winter cross-country and road races. The BAF is bankrupt. The Midland Counties registration scheme starts with a £3 per athlete annual fee. The new facilities at Broad Lane are taking shape. The Christmas Disco and the Quiz Night were both successful. A report from Rodri Jones on the BAF Endurance Conference. 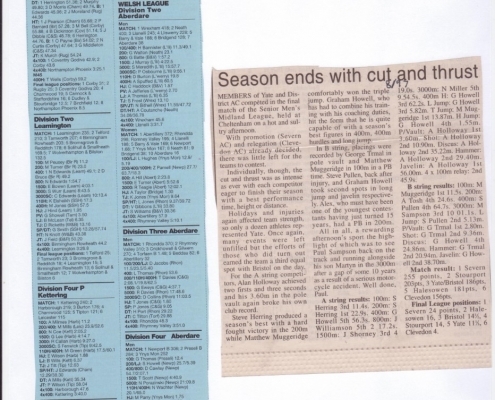 Geoff Brewer resigns from his post as Club Secretary due to an impending move to Devizes in early 1998.